More than fifteen years after communism’s fall in Central Europe, the region’s importance has never been greater. The European Union continues to evolve and has accepted the countries of Central Europe (Czech Republic, Poland, Hungary, and Slovakia) as members and partners in a unified and integrated Europe. Students who enroll in the Liberal Arts Program live and study for one academic semester in Prague, the breathtaking capital of the Czech Republic. They take academic courses that explore the rich history and culture of Central Europe and the sweeping social and economic transformations that this region has undergone over the past decade. 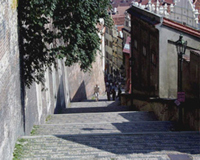 Besides living and studying in Prague, students spend a total of three weeks visiting other cities in the region, including Krakow, Vienna, and Budapest. Students are required to take two 12-week core courses: Religion, Culture, and Politics of Central Europe and 19th & 20th Century History of Central Europe. Students may choose one course from the list of 3-week elective courses.